The OPC in Franklin Square prayed for many years that it might start an OPC within New York City. After decades of praying to that end, the Lord blessed Franklin Square with a group of thirty people willing to take the giant step of moving from the security and comfort of a wonderful church home in Franklin Square to a brand new and daunting adventure: an OPC church plant in NYC. Reformation Presbyterian Church began in September 2009. The first service took place in the auditorium of a public school. This particular public school is in a town called Fresh Meadows which is in the center of NYC's largest geographic borough, a borough of 2.3 million people, the NYC borough of Queens, a place known by many as the most diverse city in the world, the "diverCity". Like all church plants, Reformation has faced its challenges. In 2011 and 2012, the NYC's Department of Education began to evict churches that were renting public schools for Sunday services. For six weeks in early 2012, Reformation had to find another place to meet. The Lord demonstrated his faithfulness by providing rent-free places during the period in which the church could not meet in the public school. In time, the politicians who had seen to the eviction of churches were replaced with politicians who were happy to see NYC public schools rented out by community groups and churches. Today, there are over 70 churches in NYC that rent its public schools for their public Sunday service – and Reformation continues to be one of them. Perhaps prompted by the experience of Sundays in another location, Reformation began thinking about other places in which they could worship. 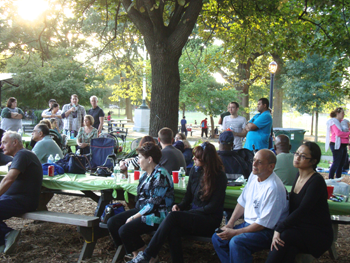 That, along with the continued desire to bring the good news of Jesus Christ to all nations by reaching Queens led to the Reformation congregation planning and hosting their first BBQ&A during August of 2012. BBQ&A is an outreach in which Reformation rents a public park for three or four consecutive Sunday afternoons in August, then cooks as much food as possible, invites as many people as possible, and "takes Sunday outside." During the time, Pastor Jon Shishko preaches a 10-15 minute sermon on a verse or two, opening up how Jesus Christ is the friend of sinners. The preaching is followed by a 20-30 minute Q&A in which anyone can ask any question. The Lord has richly blessed this annual outreach, often drawing crowds of 100 or more. This year is particularly exciting as Reformation plans to host its 5th Annual BBQ&A. Another regular challenge to Reformation is the ongoing learning curve involved with renting instead of owning. In addition to the weekly set-up, clean-up, and storage, all made necessary by renting, there is the challenge of understanding what the identity of the church is when it does not revolve around a physical building. There is no set place to have weddings, bridal and baby showers, intra-week prayer meetings, intra-week bible studies, or intra-week community groups. In fact, there is no easy place to do anything during the week. In a city where Christian community is sparse and essential, Christian community is very difficult to have! Add to this the oddity of being Christian, reformed Presbyterian Christian, and not meeting in a Church building, but rather in a public school, and one begins to see something of the challenge and adventure that has confronted the daring members of Reformation since day one. The Lord has used this challenge to develop and refine the congregation. There is always a need for people to open up their own homes, simply because there is no building to meet in during the week. So the people of Reformation are accustomed to using their apartments or homes to host men's meetings, women's studies, prayer meetings, community groups, and bridal and baby showers. The challenge of not owning a building has led to the growth of the sort of Christian community that NYC so desperately needs. Most recently, Reformation has joined the world of apps with an entirely free app for androids, iPhone, and all tablets. The Reformation Church App includes audio and video of sermons and bible studies, a text and audio ESV Bible, a bible reading plan that can be read or listened to, and a daily devotional. By putting daily devotions into the smart devices of New Yorkers, daily devotions becomes something easy to do while on subways, trains, and buses. Commuting is now a time in which New Yorkers can sanctify the times when they're stuck in traffic, because they can worship and pray by using the Reformation Church App. In addition, the app serves as a tremendous tool for notifying everyone within the Reformation community of any breaking news. 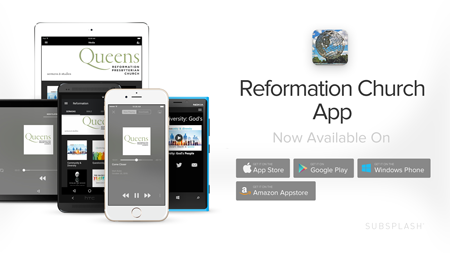 And all who attend Reformation are always able to recommend the app to others as it's available to all, for free, in the Google and Apple app stores. In addition to these online endeavors, Reformation reaches out by partnering with other Christian groups in the Queens area like Street Life Ministries (a group that feeds, ministers to, and prays with the homeless people of Queens and Manhattan) and Boro Pregnancy Counseling Center (the only crisis pregnancy center in Queens). Reformation is committed to knowing and loving the people of Queens. We seek the welfare of the city where God has sent us. We pray to the LORD on its behalf. We realize that in its welfare we find our welfare. Therefor we walk its streets regularly. We are working to invite every family in Queens to Reformation by getting 1 million invitationslink text out over the next 10 years. We are working to walk and pray through every street of every neighborhood of the entire borough within the next 5 years. We are so thankful for how the Lord is working here. Tom Harmon, a life-long resident of Queens and founding member of Reformation, was ordained as a ruling elder. This, along with 38 petitioners of presbytery and their 15 children, enabled Reformation to become a particular congregation of the Orthodox Presbyterian Church at a service on November 14, 2015 in which Tom was ordained as elder, Jon was installed as Pastor, and the Reformation congregation was particularized as a congregation of the OPC . New visitors come to Reformation each week. Currently, Elder Tom and Pastor Jon are working to get over 20 regular visitors into church membership. In addition, there is something of an ongoing baby-boom occurring. So, the Lord is building his church in Queens, and we are grateful. The decades of prayers prayed by the OPC in Franklin Square are being answered!